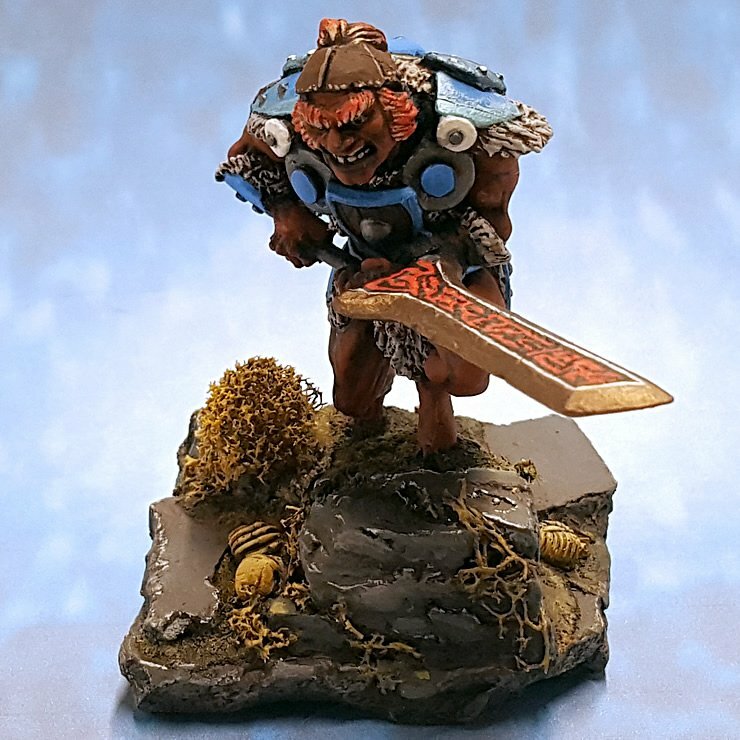 The Series continues with the merriest mini of the lot, the Bones 3 Fire Giant Jailor, joining the Joten Horde of Thrym! Now, after sitting on my desk since pulling him from his plastic bag and dry fitting him together, I’ve been considering what to do with him. The first thing was the weird shaped integral base … that needed to be fixed. 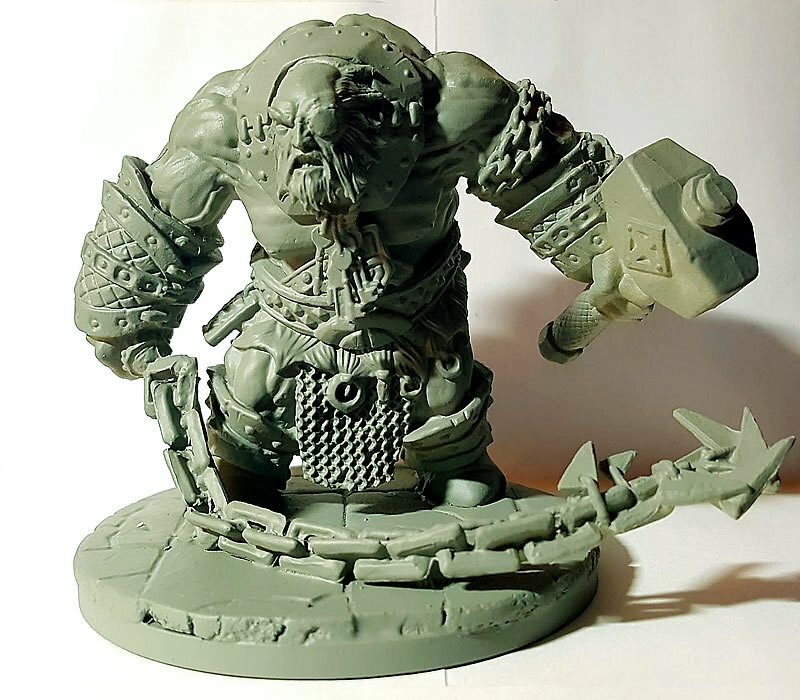 So I dug around for a something to place his base on and settled for one of the large rounds from the same Bones Kickstarter. Now, how best to expand upon the stone work of the integral base or was I going to have to dump it altogether and just use the giant. Well, I decided that I liked it a lot but the strange shape was a pain so I cut back the piece to the straight edges along one side. Then using some architectural samples I have a ton of, I proceeded to make new tiles and intentionally break them. 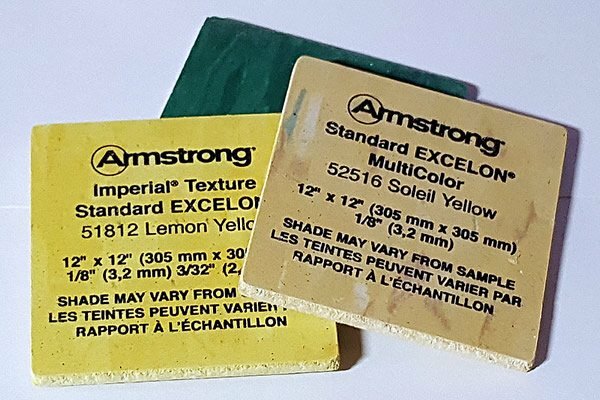 They are 1/8″ thick (3.2mm) and 2″ x 2″ in size. After cutting them into 1″ squares, breaking them into bits is easy. The rest was just a matter of doing tile work and gluing them in place. 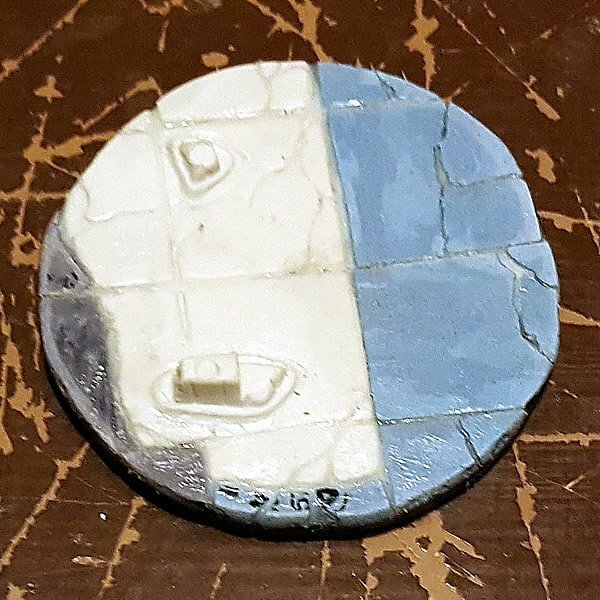 I grouted the piece with some Loctite Craft Glue. It’s heavy duty and fills in nicely … see at right. After a little sanding to remove the excess glue and roughing the edges, I used a hobby blade and carving tool to clean and define some of the lines in the integral base to better match the new tiles. I also flipped one of the cut away segments from the front for the edge on the left side of the piece (near the top of the pic above). Once that was dried and cleaned, I cleaned and glued the giant together and added him to the base. I have to do a little filling of gaps and I did glue the chain down to the tiles so it lays across the ground as if it is landing there. I just have to improve the pin for the dagger on his back belt and settle the keg on the hook off his belt. Then I can coat and prime him and begin his paint job. As used with the Dungeons & Dragons Fire Giant I did last year. 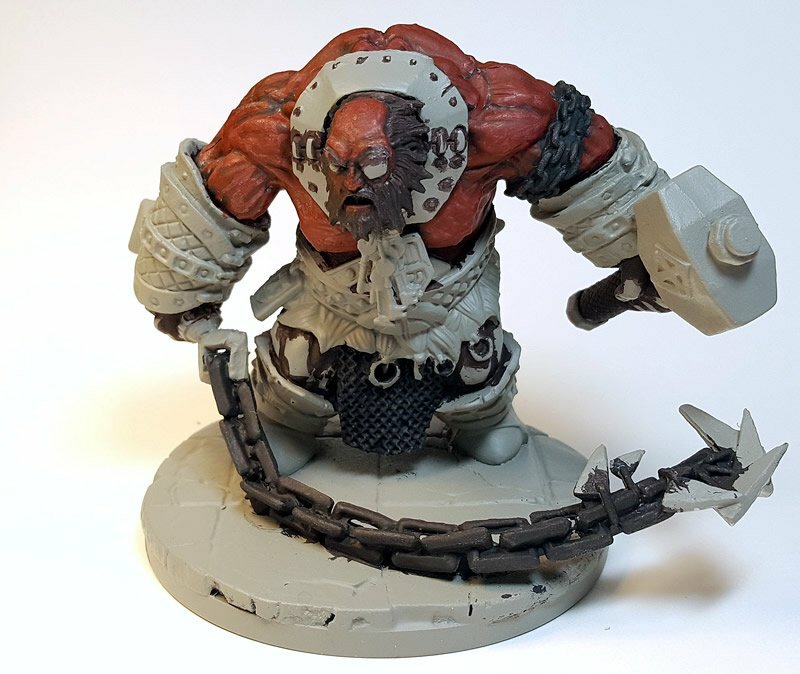 Of course, the Jailor of the Fire Giants won’t be nearly as pristine as one of their Elite Guards, so you can expect a lot of grunge and prolly some soot. 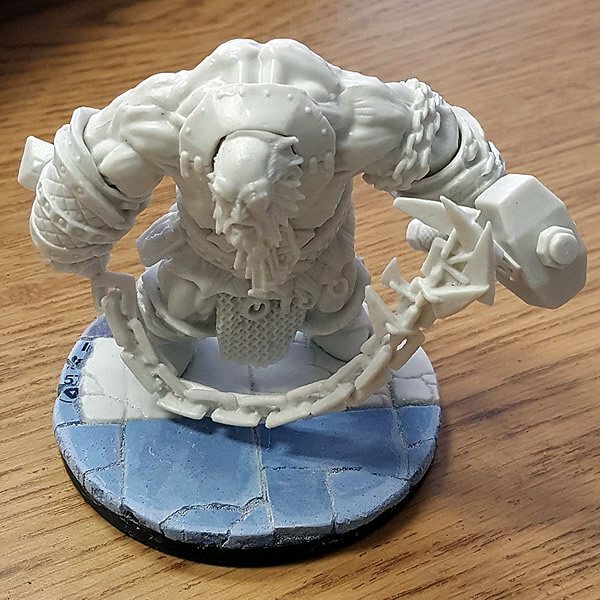 A lot of people have had issues priming Reaper’s Bones material with spray primers. This is occasionally the case and I think depends on the make up of the primer. 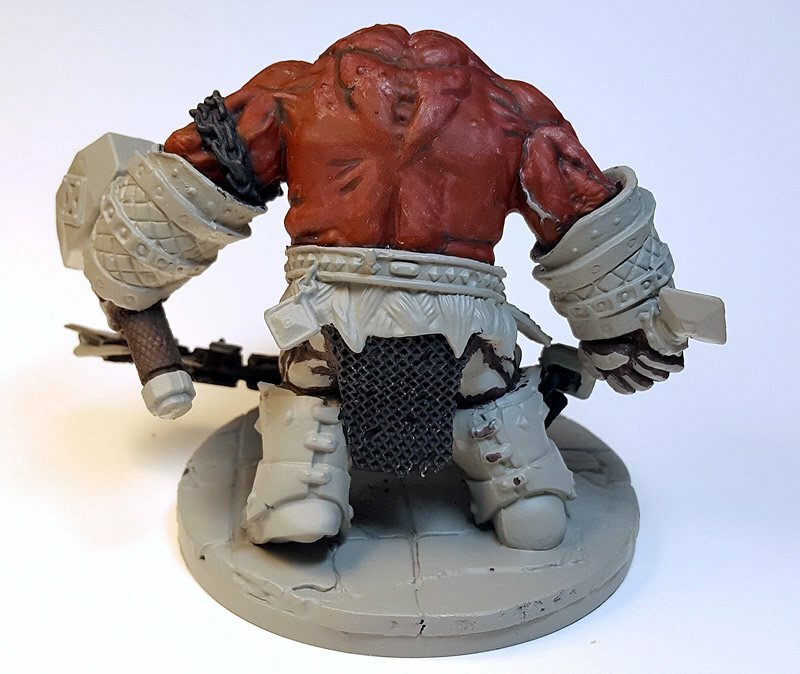 I use Armory Spray Primer which is formulated for miniatures and has been semi-successful for spraying Bones. However, if you spray the Bones material first with Testors Clear Coat (Dullcote) and then prime it with your spray primer, you shouldn’t have any issues. That said, you DO NOT have to prime Bones material IF you are going to basecoat it first. 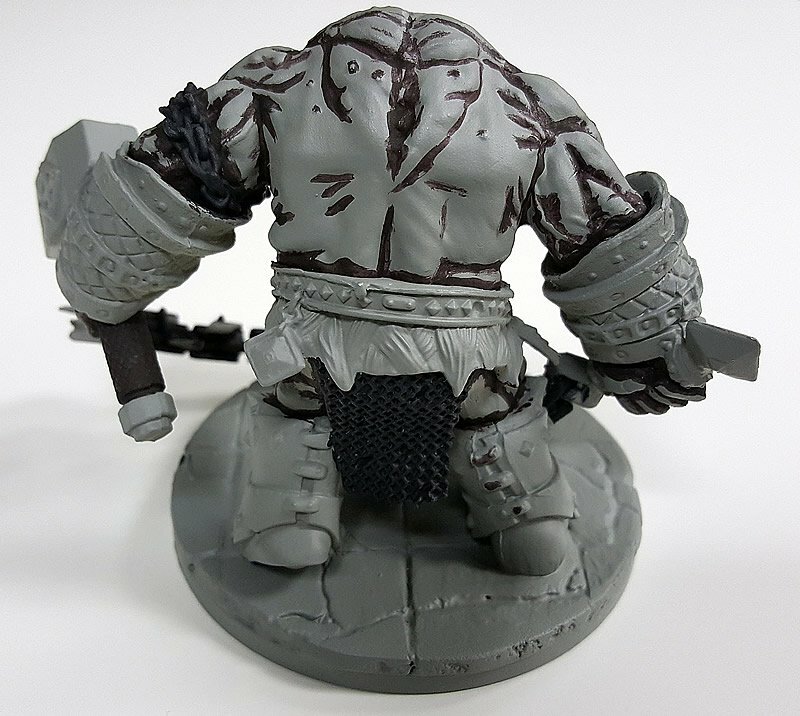 But if you paint with even the tiniest smidge more water than what comes in the paint, you will need to prime your mini first. From there the Jailor got his skin lined using Reaper Red Liner and I basecoated the handle of the hammer with more. 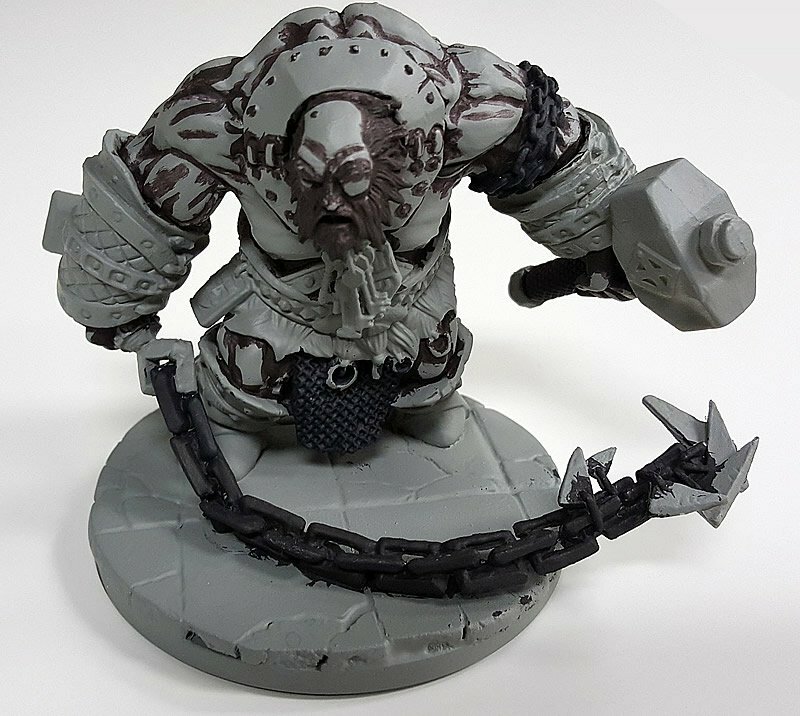 His chainmail loincloth, the chain wrapping his arm and his chain whip were basecoated with Reaper Coal Black. With the last Fire Giant I started with Reaper Red Shadow and then brightened him up with Reaper Auburn Shadow. This time I lined him with Reaper Red Liner and I think I will basecoat him with Reaper Spattered Crimson. I took a few minutes to run through the various reds I have in the ballpark of what I want and put them on a sheet of very white paper with a barcode for color correction. I decided in the end to go with the Reaper Spattered Crimson base, I can take it to the Reaper Garnet Red or Vallejo Red for the highlighting. I left the vein on his back arm to see if I like a purple over the lighter color or I like the purple over the red. There’s another vein on his other arm.